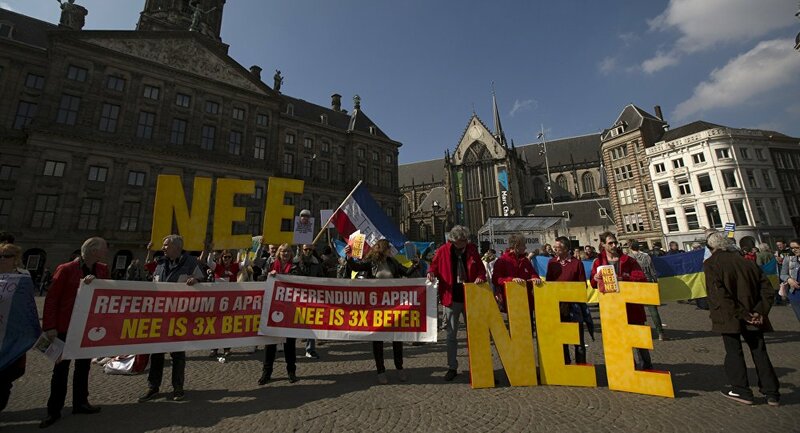 Preliminary data on the Dutch turnout in Wednesday’s referendum on EU-Ukraine partnership showed that it could nearly miss the 30-percent threshold needed for the vote to be valid. MOSCOW (Sputnik) — Preliminary data on the Dutch turnout in Wednesday’s referendum on EU-Ukraine partnership showed that it could nearly miss the 30-percent threshold needed for the vote to be valid. An exit poll by Dutch national broadcaster NOS found that 29 percent of the Dutch voted in the referendum on whether the European Union should have closer political and economic ties with Ukraine. The same exit poll indicated that 64 percent of the Dutch voted against the EU-Ukraine arrangement, while 36 percent supported the motion, according to the Dutch daily newspaper de Volkskrant. Polling stations closed at 9 p.m. local time in the mainland Netherlands but voting continued in the Dutch Caribbean islands so the estimates are not final. The NOS poll put the margin of error at 3 percent, which could be a game changer. "Landslide for NO is better, for Ukraine, Netherlands and European cooperation based on peace, security and prosperity for all. Two out of three voters oppose Association Treaty!" Dutch Senator Tiny Kox, of the Socialist Party, told Sputnik. The Netherlands is the only member state yet to ratify the agreement, which requires Kiev to implement vast reforms to meet the EU high economic, political and technical standards in exchange for market access.